Rebecca Bentley, Nursing Professional and Non-Medical Prescribing Lead, talks about further development opportunities for nurses including our preceptorship programme, clinical supervision, educational support and continued professional development, alongside opportunities for non-medical prescribers and advanced clinical practitioners in mental health. Leadership and Management Development Passport programme – The Leadership and Management Development Passport (LMDP) programme is aimed at leaders and managers within our Trust, and those aspiring into a leadership or management role in the future. The programme brings together our leadership and management learning and development opportunities, and resources to support staff development. Good leadership and management are at the heart of the Trust’s culture; we believe that the way we do things is as important as what we do, and that leadership behaviours are everyone’s business. We aim to find ways to encourage people to combine their efforts, talents, insight, inspiration and enthusiasm to work together to achieve success. Confidently lead, motivate and manage teams and individuals. The LMDP allows leaders, managers and aspiring managers to tailor their learning according to their own personal development needs. Three learning programmes make up the full LMDP: ‘Bradford Manager’, ‘Management Fundamentals’ and ‘Engaging Leadership’. Learning opportunities within the programme include a mix of face-to-face practical workshops, e-learning, one-to-one coaching and mentoring support and access to self-directed learning resources. Our senior staff development programme forms a yearlong secondment for community nurses to become senior community nurses. Each nurse on the programme is supported with an extensive training programme and individual mentor. 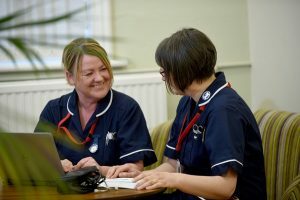 The senior staff development programme provides community nurses with the skills and experience to apply for university courses to become a district nurse. Read about Tara’s experience of the programme. Our preceptorship programme supports you with a structured period of transition if you are newly qualified, returning to practice after a substantial break or moving to a new area of practice. The programme encourages continual professional development and lifelong learning. Our high quality preceptorship programme provides you with a flexible framework to meet your needs. We are fully committed to investing in you as a new starter in our organisation and through our preceptorship offer, will support your smooth transition into your new role, to develop your career.